Scattering is a very powerful tool to study the structure of polymers. 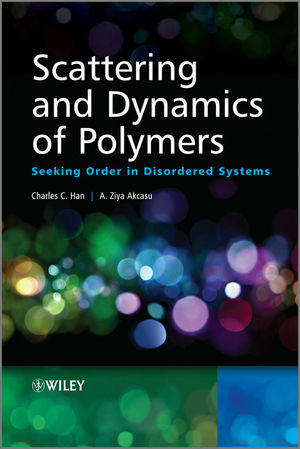 Written by highly regarded and respected scientists in the field, this book presents the latest developments in the field of scattering in a uniform, systematic manner. This volume arms readers with both theoretical and experimental aspects of the intended area, offering much simplified theoretical explanations on the physics of scattering. The authors provide discussion on applications of experimental techniques. Han and Akcasu begin with a traditional treatment of light scattering from plane waves, followed by consistent application of density (in both real and Fourier space) correlation functions in both space and time. The authors do not distinguish among light, X-ray, and neutron, excepting their scattering length, q-range, coherence and detection differences. Readers can therefore concentrate on exactly the scattering tools they need to use, while theoretical explanation on the physics of scattering can be made much more simplified and uniform. Charles C. Hanis a Professor of Polymer Physics at Institute of Chemistry, Chinese Academy of Sciences, where he has served as the Director and Chief Scientist of the Joint Laboratory of Polymer Science and Materials, and the Director of the State key Laboratory of Polymer Physics & Chemistry. He has also worked as an adjunct professor at Peking University, Sichuan University, Qingdao University of Science & Technology and Tsinghua University, as well as a visiting professor at Changchun Institute of Applied Chemistry, Chinese Academy of Sciences. He worked as a research scientist and group leader for the National Institute of Standards & Technology from 1974 to 2002. From 1985 to 1989, Han was the US Representative at VAMAS (Versailles Project on Advanced Materials & Standards). Han is a member of American Chemical Society, American Physical Society and Sigma X. Han's research mainly concentrated in the area of Scattering (including static and dynamic light scattering and neutron scattering) in Polymer Physics: Solutions, Bulk, and Blends and he holds four US patents and ten China patents. He also holds considerable honors including High Polymer Physics Prize (American Physical Society). He is also a very active with the editorial boards of Polymer journals. Han received a B.S. from National Taiwan University in Chemical Engineering, a M.S. from University of Houston and a Ph.D. from University of Wisconsin, both in physical chemistry. Ziya Akcasu is a Professor Emeritus of Nuclear Engineering at the University of Michigan. His research interests include nonlinear reactor dynamics, theory and applications of stochastic differential equations, dynamics of dense fluids, calculation of time-correlations and transport coefficients, dynamics of macromolecular solutions and melts. He received a Ph.D. in Nuclear Engineering from the University of Michigan and worked for the school since then. Foreword by Professor (Timothy P. Lodge). Foreword by Professor (Hyuk Yu). 1 Plane Waves, Scattering, and Polymers. 1.2 Molecular Weight of Particles with Thermodynamic Interactions. 1.3 Scattering Structure Factor of a Polymer/Point Scattering. 2 Fluctuations, Correlation, and Static/Dynamic Scattering. 2.2 Density in q and t Space. 2.3 Some Properties of Sðq; tÞ and Dynamic Scattering. 2.4 Examples of Dynamic Light Scattering in Polymer Solutions. 2.4.1 Concentration Dependence of Diffusion Coefficient at Various Molecular Weights and Temperatures. 2.4.2 Molecular Weight and Temperature Dependence of Polymer Dimensions in Solutions. 2.4.3 Molecular Weight and Temperature Dependence of Intrinsic Viscosity of Polymer Solutions. 2.4.4 Dynamic Light Scattering in Polydisperse Polymer Solutions. 2.4.5 Molecular Weight Measurement by Dynamic Light Scattering. 2.4.6 Dynamic Light Scattering of Dilute Polymer Solutions in the Nonasymptotic q-Region. 2.4.7 Dynamic Light Scattering of Semidilute Polymer Solutions. 2.5 Light, X-Ray, and Neutron Scattering. 2.5.1 Light Scattering from Dipoles. 2.5.2 Scattering of X-Rays by Electrons. 2.5.3 Scattering of Neutrons by Nucleus. 2.5.4 Comparision of Light, X-Ray, and Neutron as a Probing Scattering Wave. 2.A Gaussian Stochastic Variable Approximation. 2.C The Basic Scattering Laws for Incompressible Systems. 3 Dynamics and Kinetics of Phase Separation in Polymer Systems. 3.1 Thermodynamics of Polymer Blends. 3.1.1 Flory-Huggins Lattice Model and Phase Diagram of Binary Polymer Blend. 3.1.2 Ehrenfest Classification of Phase Transition and Thermodynamic Stability. 3.2 The Theory of Kinetics of Phase Separation. 3.2.1 Free-Energy Functional in a Binary Polymer Mixture. 3.2.2 Kinetics of Binary Polymer Blends, and the Linear Cahn-Hilliard-Cook Theory. 3.2.3 Langevin Equation in Nonlinear Systems. 3.3 Spinodal Decomposition in Normal Binary Homopolymer Systems. 3.3.1 More Details on the Cahn-Hilliard Theory. 3.3.2 Experiments on Spinodal Decomposition. 3.3.4 Temperature Step Experiments within the One-Phase Region. 3.4.1 Fluctuations in the Metastable Region. 3.4.3 Properties of the Nuclei. 3.5 Phase Separation and Phase Behavior under Shear Flow. 3.5.1 Shear Effect in the One-Phase Region. 3.5.2 Shear Effect in the Two-Phase Region. 3.5.4 Nucleation Phase Separation under Shear Flow and Other Rheological Methods. 3.6 Spinodal Decomposition in Complicated Systems. 3.6.2 Spinodal Decomposition with A-B Diblock Copolymeras Additive. 3.6.3 Spinodal Decomposition in Hydrogen Bonding System. 3.6.5 Phase Separation with Wetting Phenomenon. 3.6.6 Coupling between Phase Separation and Crystallization. 3.A Nonlinear Langevin Equation Approach to the Kinetics of Polymer Mixtures. 3.A.1 The Most Probable Path. 3.A.2 Evolution of the Thermal Fluctuations about the Deterministic Path. 3.A.3 Implications of Equation 3.A.24. 4 Statistical Mechanical Approach to the Theory of Dynamic Scattering. 4.2 A Brief History of Brownian Movement. 4.3 Einstein’s Explanation of Brownian Movement. 4.5 Scattering from Non-interacting Brownian Particles. 4.6 Zwanzig-Mori Projection Operator Technique. 4.7 Molecular Theory of Brownian Movement. 4.8 Markov Processes and Fokker-Planck Equation. 4.9 Stochastic Differential Equation and Fokker-Planck Equation. 4.14 Molecular Weight Dependence of the RG=RH-Ratio and a Method for Measuring the Draining Parameter. 4.15 Calculation of the Dynamic Scattering Function. 4.15.1 Interacting Brownian Particles in Solution. 4.15.2 Generalized Langevin Equation for S(q,t) in a Dilute Solution: Projection Operator Formalism. 4.15.3 Dynamic Scattering Function for a Gaussian Chain without Hydrodynamic Interaction (Rouse Dynamics). 4.15.4 Other Forms of Sðq; tÞ. 4.15.5 The Effect of Hydrodynamic Interaction. 4.B Diagonalization of the Rouse Matrix A. 4.C Solution of the Diffusion Equation without Hydrodynamic Interaction.